Our living room is done mostly in earth tones, so it's difficult to find coordinating accent pillows that do not scream autumn. 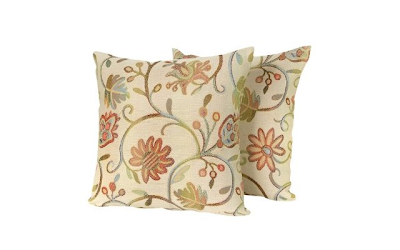 I came across this pair of 18" square pillows that are part of the "Lacey" collection on Target.com. The colors are perfect for our living room and the light background makes these pillows better suited for the spring and summer months. What makes these pillows an especially good fit for our household is that the zip-closure removable covers are machine washable. This is an extremely attractive feature for me since we recently lost one of our pillows in January when the whole family came down with the stomach flu. Our dearly departed pillow just could not be saved.